Technology is always changing and evolving. It’s a simple fact. So how can you, as a manufacturer of electronic products, keep up? We know you can’t afford to keep every electronic component, be it an integrated circuit or specialty electronic part, on-hand without running out of space at your warehouse. Luckily, we’re going to let you in on the biggest little secret in the electronic parts industry. Surplus Electronics suppliers. You can find thousands of vendors that are buying and selling used and surplus electronic parts and electronic components. The majority of which, offer you warranties on the products they buy and sell. The Surplus Electronic Industry is growing, right alongside with the technology parts it provides. That means better prices, better access to the parts you are looking for, and of course, better service. IC Plus is one such company. Located in Southern California, IC Plus has been buying and selling surplus electronic parts and integrated circuits for more than 20 years. IC Plus is known in the industry as paying the best price for a variety of components and integrated circuits. IC Plus has an easily searchable database of parts, a painless transaction process and offers you a number of ways to sell your surplus electronic parts through lot purchases, on-site consignment or off-site consignment. IC Plus has the ability to buy your company’s surplus inventory on a lot basis or outright. A common problem with surplus electronic parts are certain buyers will only choose to purchase a few items. That leaves you with an excess of a number of electronic components. IC Plus wants to be there for you for you in the long-term, whatever your excess needs. In some instances, the only way you might be able to sell electronic components and integrated circuits to sell it onsite. In this case, what IC Plus does is negotiate a purchase price for all of the surplus electronics that you would like to sell. In this scenario, IC Plus requires exclusive access to the products to ensure availability. In addition, IC Plus requires you to provide someone from your company to be the point person to contact to process orders and update inventory. One of the most cost-effective ways to rid yourself of surplus electronic components is to allow IC Plus to consign your goods from our facility. Our warehouse is secure and large enough to accommodate all of your surplus goods. Having your excess products out of your facility and into our warehouse, not only makes room for you, but it allows us to better sell your electronic components. With the parts on hand, we are able to advertise the electronic parts a customer wants as in-stock. In addition, we are able to ship a part by next-day deliver to our extensive, loyal customer base. By having us handle the selling aspect of your surplus means that you don’t have to dedicate someone from your staff to act a as a liaison and saves man hours. In addition to offering the best prices for companies to sell off their surplus of electronic parts, IC Plus also is a leader selling electronic components and integrated circuits to those who are looking for a specific electronic component. Check out IC Plus’s growing database of surplus electronic components today. Thyristors – the choice electronic component for supplying power to circuits. If your electronic component needs include dealing with large sources of power, you may be in the market for thyristors. Also known as silicon controlled rectifiers (SCR), a thyristor is a four-layer semiconductor that is built to handle large amounts of power. The thyristor’s specialty is controlling power circuits. The thryristor electronic parts can be turned off or on, but typically can only be turned off by switching the direction of the current. In addition to being turned off and on, thyristors can allow the amount of power to be controlled by adjusting the angle of the current. A simple example of this type of use is the dimmer on a light switch. The idea for the thyristor was conceived in the 1950’s, by one of the creators of the transistor, but it didn’t gain popularity until a decade later when it was brought to the general consumer market by General Electric. Thyristors soon became the choice electronic components to buy for supplying power circuits. In the early 1970’s the electronic parts were even being used in color televisions to help stabilize power their supplies. Thyristors also have a long history of use in the motion picture industry and theaters where they replaced older technology. Thyristors work differently from other electronic components as no current actually flows across the device. When a power supply is connected to the device a small amount flows into the gate and the thyristor fires and conducts. The thyristor then remains conducting until the power supply is removed. . The electronic components are generally made from silicon because it can handle high voltage and power currents. Silicon is also known for its thermal properties. Silicon is also affordable and can be bought and sold cheaply for manufacturing use. Analogue electronics often make use of thyristor technology. Thyristor circuits are widely used and available at affordable prices. IC Plus is a certified electronic component distributor and has access to stocks of newer and obsolete surplus thyristor components. The company sells surplus thyristors made from all kinds of manufacturers. Whether you are looking for a Gate Turn-Off Thyristors (GTO), Reverse Conducting Thyristors (RCT), a Base Resistance Controlled Thyristor or a Static Induction Thyristor (SITh), chances are, IC Plus has the surplus thyristors components you are searching for at an affordable price. Buying surplus thyristors for your electronic component needs is the smart, affordable way to go. IC Plus ensures all of the surplus electronic it buys or sells are the of the highest quality functioning components. If you have surplus thyristors that you would like to sell, IC Plus buys lot purchases or will sell your surplus thyristor inventory for you. There is no harm in buying surplus thyristors for your large power sourcing needs. IC Plus buys excess inventory, which means many the thyristors you buy from IC Plus are brand new and you have the benefit of getting a great deal. IC Plus looks forward to helping you will all of your electronic component buying needs. Click here to start searching for the surplus thyristors that you are in the market to buy. 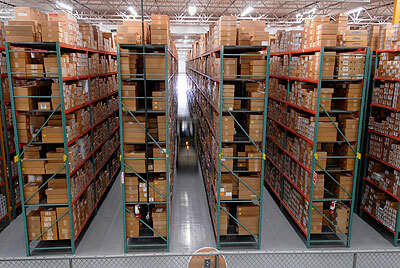 Our search system will quickly and easily help you find the electronic parts you are looking for. A resistor is a passive two-terminal electronic component which is used to control voltage by restricting the flow of current in a circuit. Resistors may also protect sensitive electrical components from exploding or blowing due to excessive voltage. Higher resistance means that there will be less current in a circuit. Resistors may either look microchips, or they may be a wire with a small, bead-like colored cylinder of resisting material around it. They are common elements of electronic circuits and electrical networks and are found in almost all electronic equipment. They can be implemented within integrated circuits (microchips), especially in analog devices, and also may be integrated into printed and hybrid circuits. Resistors can be joined in different combinations in order to complete a circuit. They may be linked in a series, where the resistors are connected on after the other, or that may be parallel, where the resistors are connected over one another. When linked in a series, the current through all of the resistors will be the same, but the voltage across each one will be in proportion to its resistance. When in a parallel configuration, resistors are all subject to the same voltage, but the currents through each one will increase. There are many varieties of resistors available. Each has a different rating to indicate its resistance to electricity. If a resistor is met with too much power, it may break or its function may become erratic. The bead-like style of resistor has a series of colored bands around it to indicate its rating. Other types of larger resistors are marked numerically, however most modern resistors are so small that marking them is impractical. A resistor’s color may also indicate its rating. Resistors may be made out of many different materials. In the past, resistors were made from solid carbon, but this type is rare now because it did not fare well with air moisture and can be too expensive to make. Many modern resistors do still utilize carbon as a film. Other modern resistors are made from metal or wire. Newer resistors are also much better at handling air moisture and high heat from electricity. In a properly designed circuit, the failure rate of resistors is much lower than that of other electronic components like electrolyte capacitors and semiconductors. Resistors most often become damaged due to overheating when they receive too much power. This problem can be avoided by ensuring that the resistor is chosen and installed properly. A printed circuit board (PCB), sometimes called an etched wiring board, is the base on which an electronic circuit is built. A printed circuit board mechanically supports and electrically connects many electronic components using conductive pathways or tracks. These pathways are etched from sheets of copper and then laminated onto a non-conductive substrate material. When electronic components are attached to the printed circuit board, it is then called a printed circuit assembly (PCA). Printed circuits are used in almost all commercially-produced electronic devices. The earliest printed circuit boards were introduced in the early 20th century. Before printed circuits became popular, the less efficient and clumsier point-to-point construction was used in electronic circuits. This method has been nearly eradicated today. In early circuit boards, every electronic component had wire leads and the board had holes drilled into it for every wire of every component. These leads were passed through the drilled holes and soldered to the circuit board. This assembly method is called through-hole construction, and is now considered wasteful and expensive. More recently, the use of surface mount electronic components has become more popular due to the demand for smaller electronics, smaller packaging, and greater functionality has increased. Surface mount electronic components differ from older components in that they are mechanically redesigned to have small metal tabs or end caps that may be soldered directly onto the surface of the printed circuit board instead of having protruding wires. This type of surface mounting allows excess electronic components to be placed on both sides of the board, which was more difficult to accomplish with through-hole construction. In turn, using both sides of the circuit board allows high circuit densities. Also, it is much easier with surface mount technology to manufacture circuit boards with an automated machine, which cuts labor costs and speeds up production. 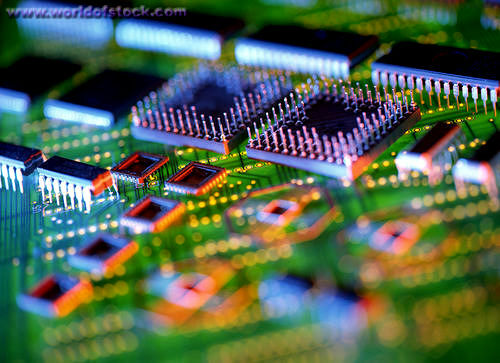 Printed circuit boards are found in many electronic components. Often, they are used in conjunction with their smaller successor, the integrated circuit, or microchip. The integrated circuit is a much smaller circuit board that has been etched with light into a semi-conductive surface, such as silicon. These etchings are then filled with a diffusion of trace conductive elements to create a working electronic circuit. Because of their small size and singular construction, integrated circuits are very cost effective to manufacture. However, technology has not reached the point at which microchips can completely replace the printed circuit board, so the two technologies are often found side by side in the same electronic device. A diode is a two-terminal electronic component. Today, the most common type is the semiconductor diode, which is a small crystal made of semi-conductive material and connected to two electrical terminals. Most semiconductor diodes are made from a silicon crystal which has impurities added to it intentionally to create an area on one side that contains negative charge carriers called electrons, and a region on the other side that contains positive charge carries called holes. A less common (though still available) type is the vacuum tube diode, which is a vacuum tube with two electrodes called either the plate or the cathode. The function of a diode is to let an electric current pass through in one direction (the diode’s forward direction), and to block current from passing in the opposite direction (the diode’s reverse direction). Unidirectional behavior in electric current is called rectification, and is used to convert alternating current (AC) to direct current (DC), or in radio receivers to extract modulation from radio signals. There are many different types of semiconductor diodes on the market. One type is the silicon-controlled rectifier diode. It is made by alternating layers of positive and negative semi-conductive layers of silicon mixed with trace impurities. This type is generally used in devices where the control of high power, and possibly high voltage, is necessary. They are suited for use in medium or high voltage AC power control applications, such as motor control, regulators, or lamp dimming. Another type is the Zener diode. This type of diode is different from other kinds in that it allows current to pass in the forward direction like a regular diode, but it also allows current to flow in the reverse direction when the voltage rises above a certain value, which is called the breakdown voltage. This type of diode is often used in solar panels. A different kind of diode, called the avalanche diode, functions in a similar way and is used in similar situations. A fourth type of diode is the tunnel diode. This type of diode is capable of much faster operation that some other types, reaching frequency rates well into the microwave region by using quantum mechanical effects. Among other uses, tunnel diodes are actually used in space applications such as amplifiers for satellite communications. These are just a few types out of a great variety of diodes available. Like any electronic component, each type of diode is suited to a different type of function. Ic Plus specializes in surplus electronic components. A capacitor, sometimes called a condenser, is a passive electronic component that stores electric charge. There are many different forms of capacitors, but each one has at least two conductors separated by a non-conductor. Conductors are similar to batteries, but are smaller, lighter, and charge much quicker. Capacitors are made from two metal plates, called conductors, that are on top of and near one another, but do not touch. The conductors require a lot of surface area to provide capacitance (the ability to store an electric charge), so capacitors are often rolled or folded into another shape (like a cylinder). These conductors are separated by an insulator called a dielectric. The size and type of dielectric determines whether the capacitor is better suited for high frequency or high voltage applications. For example, capacitors with Mylar dielectric are most commonly used in timer circuits like those in clocks or alarms, while capacitors with ceramic dielectric are most commonly used in high-frequency purposes like X-ray and MRI machines. A capacitor allows alternating current (AC) to pass, but blocks direct current (DC) signals. Because of this property, capacitors are often used to separate the AC and DC parts of a signal. This use is called capacitive or AC coupling. There are many ways that capacitors can be used, and at least one is included in almost every electrical product. One way a capacitor can be used is for energy storage as a sort of temporary battery because capacitors can store electric energy even when disconnected from their charging circuits. They are often used to maintain power supply while the batteries of electronic devices are charged. Capacitors can also be used to provide large pulses of current for pulsed power applications such as pulsed lasers, radar, and particle accelerators. Reservoir capacitors (large capacitor banks) are also used for detonators in nuclear weapons and some other types of specialty weapons. There are many possible uses of a capacitor. Although useful, capacitors can be very dangerous because they sometimes retain their charge long after the power source has been removed from the circuit. If the wrong part of an electronic device is touched, the stored charge in the capacitor can cause a painful or even fatal electric shock. Electronics often contain instructions and warnings to avoid this danger. When working with equipment containing larger capacitors often requires special wrist straps to be worn to protect both the user and the equipment. While there are risks when using capacitors, they are also very useful and are integral to modern technology. Integrated circuits: Integrated circuits are a small electronic device that is made of semiconductor materials. They have a very funny history, because at almost the exact same time, two inventors made two similar integrated circuits, without knowing about one another’s work. So, great minds did think alike in this case, but the inventor that took the Nobel Prize in 2000 for his work was Jack S. Kilby. The other inventor, Robert Noyce became the co-founder of Intel, one of the largest producers of integrated circuits today. Before this great invention, the scientists were using vacuum tubes in every attempt of building complex electrical circuits. Vacuum tubes were huge and they were generating a lot of heat that was very common to burn out. Imagine that the first digital computer ever build had a weight of 30 tones and 18000 vacuum tubes. From the first prototype of integrated circuits developed until now, progresses have been made very quickly. The microchips that are being produced these days are containing millions of components on a very small area, comparable with a fingernail. The progress went so far that today there can be put thousands of transistors on an area equal with the cross section of a human hair. The expansion in this area is still going on and every year more improvements appear. Integrated circuits are being used for a variety of devices like microprocessors, audio and video equipment, even automobiles. As a categorize by the number of the electronic components that they contain, there are SSI (small scale integration), MSI (medium scale integration), LSI (large scale integration), VLSI (very large scale integration) and ULSI (ultra large scale integration). But the three most important classifications for the integrated circuits are digital integrated circuits, mixed signal integrated circuits and analog integrated circuits. The first is being used in making computer system, but also they can be found on cell phones, stereos or televisions and they include microprocessors, microcontrollers and logic circuits. Mixed signal integrated circuits can be found in cell phones, instrumentation, motor and industrial control applications. They can convert digital signals to analog signals, convert digital signals to waveforms so that digital instruments can play music. Analog integrated circuits are mostly used in power supplies, instruments and communications and they have the ability of amplifying, filtering and modifying the electrical signals. For examples, in cell phones, analog integrated circuits filter and amplify the incoming signal from the phone’s antenna. Diodes and circuit boards: Diodes are semiconductors devices that only let the electric current pass one way. Every diode has marked an arrow to the way that the electric flow is being allowed. They can vary in size, but the most common kind used today is semiconductors diodes. They are being used for many ways, like batteries that often contains diodes to protect the equipment if the battery is put backward. There can also be found a variety of other types of diodes like: the Zener diode, used for intensity stabilization, Varicap diode, Tunel diode, Gunn diode. They can be used as voltage regulators, frequency multiplying devices, mixing devices, switching applications or they can be used in making logic decisions in digital circuits. Some diodes and electrical components can give “light” and most of the people know this in the term of LED (light-emitting-diodes) that are used even in the domestic lightning or illuminating in general, as well as a sensor, in the telecommunications, especially for the remote controllers. A LED produces light more from electronic excitation than heat generation and it is so common these days that the inventors had no idea how great their idea will be. Circuit boards, on the other hand, were created in the 1930s and in that time they were used in the World War II for radios. Before they could go out the market for a more variety usage, a long time circuit boards stayed only in the military area. It is mostly known as PCB – Printed Circuit Board and it is like a plate on which there are put chips or another electronic components. Circuit boards may also refer to printed circuits assemblies, or printed wiring boards and capacitors. They are being used in computers, mobile phones, gaming devices and video players. Most of the producers of electronic devices prefer using circuit boards because they have a small cost, they last long and they are very durable. One of the most important roles of the circuit boards is regulating the flow of power for various aspects of a device. They are made of copper foil and everyone can recognize the green layer that is being coated on every circuit board. Also, before entering the market, every circuit board is being tested, so that it could not be the risk of damaging the device it will be put on or to melt if the temperature gets too high or even worse, to start an electrical fire. Semiconductors & transistors: Now, on the 21th century almost everything is being computerized. And there are some small pieces that keep everything from falling apart. These components are semiconductors and they have an important role in all kind of electronic circuits that have a large usage like consumer electronics, telecommunications equipment, home appliances, and also automobiles and they are known as the pulse of the microprocessor chips or transistors. And that’s not all, because in the past few years semiconductors found a lot more uses in the process of making different new products. When a semiconductor was first created, its goal was to replace the vacuum tubes used in the past for televisions and radios. This way, the electronic devices went smaller and smaller with a more complex structure. Semiconductors are made of germanium or silicon and they can be doped with other impurities to change their characteristics. The term semiconductor is used to describe a solid material that cannot be considered neither a conductor nor an insulator. In fact, at high temperatures, a semiconductor acts more like it is a metal and it is very conductive and instead, at low temperatures, a semiconductor acts more like an insulator, so that at a normal temperature, its particularities come in the middle. Transistors are the most important type of electronic devices, because they have the possibility of amplifying the electric signals. They can also be used as switches. A transistor is a semiconductor device and it is made from germanium and silicon, too. It was invented in Bell Laboratories by three physicists that got the Nobel prize for physics in 1956 and it is considered one of the best inventions of the 20th century. Nowadays, transistors are being used for all kinds of devices, such as electronic equipments, signal amplifiers (in the video, audio, radio area), amplifiers for instruments, oscillator , modulators and demodulators, filters or integrated circuits (today’s technology gives the opportunity of integrating millions of transistors in just one capsule. Transistors have become irreplaceable these days and beside their importance in the modern technology, they are flexible and reliable so that now most of the electronic devices depend on them. Also, as the semiconductors, the role of transistors was initially to replace the vacuum tubes, the main components of that period’s electronic equipment. And because their costs are very low, one started the usage of transistors, the price of computers and other electronic products dropped. Circuit boards or commonly known as printed circuit boards are boards that contain electronic components such as diodes, transistors, integrated circuits and other electronic components. However, prior to being mounted with components the circuit boards are just plain sheets of insulating material such as fiberglass coated with conductive material which is usually copper on one side or on both sides. There are some circuit boards that have multiple layers. These types of boards are usually used for complex electronic devices such as Mother Boards found in computers. In a printed circuit board the components are connected to each other using either one of two methods. The first and older method is through-hole technology while the second and newer method is surface mount technology. Through-hole technology uses thin wires or leads that are pushed through the small holes in the substrate of the board(which may be composed of fiberglass or a resin) and is secured by a solder to the opposite side of the circuit board. The components used in through-hole technology such as wires, diodes and transistors are much larger compared to its surface mount technology counterpart. Surface mount technology, meanwhile, does not make use of drilling holes. Surface mount technology is performed by directly placing the components on the surface of the board. The circuit board is then slowly preheated using infrared lamps, which slowly melts the solder of the mounted components unto the surface of the circuit board. The solder is then hardened by slowly cooling the finished circuit board. Surface mount technology also enables more space and is more light weight as surface mount technology components are smaller compared to through-hole technology components. Integrated circuits are a very important piece of the puzzle. The earliest circuit boards are known to be used as early as the 1850s. This was composed of metal strips or rods that are used to make a connection between enormous electronic components that were mounted onto wooden bases. Eventually, the rods or metal strips where replaced by wires and the wooden bases were replaced by metal bases. Soon, the increasing demands for smaller and much more compact designs eventually lead to the innovation of making electrical paths on the insulated surface of the circuit board. This was accomplished by printing while being guided by a stencil the conductive ink the electrical paths unto the circuit board. This was the first method of making a printed circuit board that was then patented in the US in 1925 by Charles Ducas. Circuit boards since then have been evolving slowly in size and in complexity. Originally used by the military and other industries. Circuit boards are now in almost all electronic devices. These devices range from computers, mobile phones and other portable devices that use electronic components. This has resulted in and the substantial rise of the prices of rare earth metals. Although the rare earth metals are not used to manufacture circuit boards, they are used for the components that are surface mounted onto these circuit boards. A known fact is that China holds more than half of the world’s rare earth metal deposits and is slowly using it to bolster their position economically and politically. As the information age forces us to adapt to technology at an ever-increasing pace, the production of circuit boards along with the electronic components that require rare metals is critical to the perpetuation of the ever-increasing amounts of information that we process daily.